Fresh basil smells and tastes heavenly. Unfortunately, I had maybe only used it a time or two in my years of cooking, opting for dried, crushed basil. The dried version made more sense as it lasts longer and goes further. Amy offered fresh basil to me from her garden last week after our small group. (Small group is a weekly get together of some church friends, and friends of friends, who have dinner together, hang out, and have a fun, engaging conversation discussing our lives as they apply to a specific topic in the Bible. It’s a really great way to build deep relationships and grow in our faith – and we have a blast.) I tried to decline the basil, as I wasn’t sure I even liked basil, but she was kind of insistent, so I snapped off a large stem. Basil. In my car. It’s like a heavenly air freshener. Who knew? So, I’m letting the basil trimming grow roots in a jar of water so that I can plant it and keep indoor, fresh herbs. Each time I pick off a leaf, I consider my earlier beliefs about the superiority of dried basil. No, the dried basil doesn’t actually last longer than a living, breathing plant. Not with the same levels of flavor and aroma. Not in the least. With a few minced leaves, I can flavor an entire dish far better than with a teaspoon of a dried, aged alternative, and my trimming of basil will last indefinitely – assuming I can keep it growing. I’ve begun adding fresh basil to many things, including my water, homemade butternut squash soup, quinoa salads, and fresh, sauteed vegetables. Most importantly, Brussels sprouts. 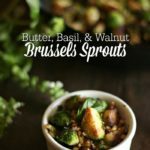 Butter, Basil, & Walnut Brussels Sprouts are tender, flavorful, nutritious, beautiful, and present a completely gourmet side dish to dress up any meal. Plus, the recipe doesn’t take much time, leaving more time to attend to the prep of your other dishes. This dish quickly became my favorite. The addition of fresh basil and crushed walnuts adds a really pleasing taste and texture, as well as lovely presentation, to a simple dish. Please. I implore you… do not use frozen Brussels sprouts. 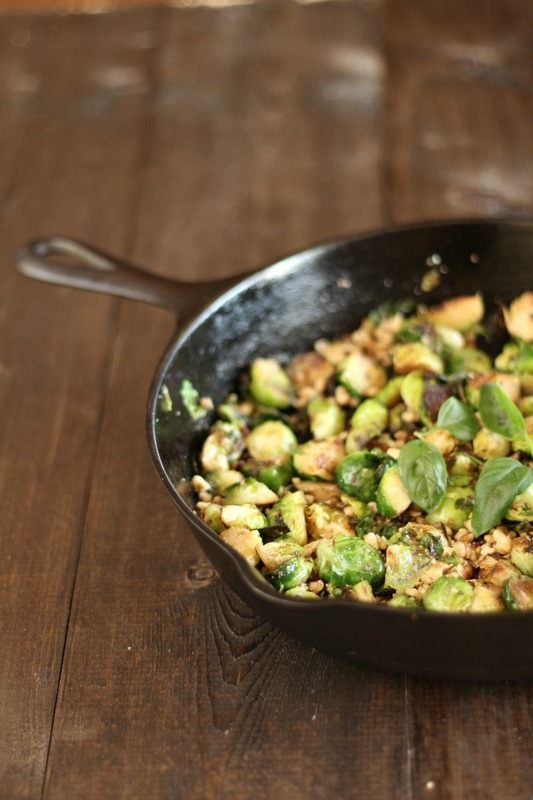 If you’ve only had frozen Brussels sprouts…do they even sell them canned?… then you’ve had something else. The edibility of those vegetables is highly questionable. I love almost all foods, but I cannot eat a water-logged, spongy, miniature cabbage from the freezer. Take a few more minutes and wash, trim, and saute the fresh ones yourself. They are wildly different and absolutely delicious. Thanks for the fresh basil, Amy! It’s my new favorite! 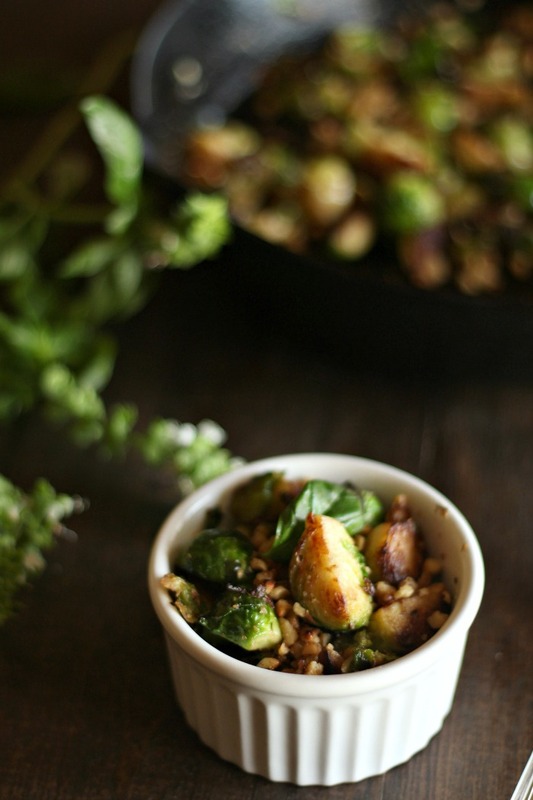 Brussels sprouts with butter and basil are a simple, yet classy, delicious side dish. 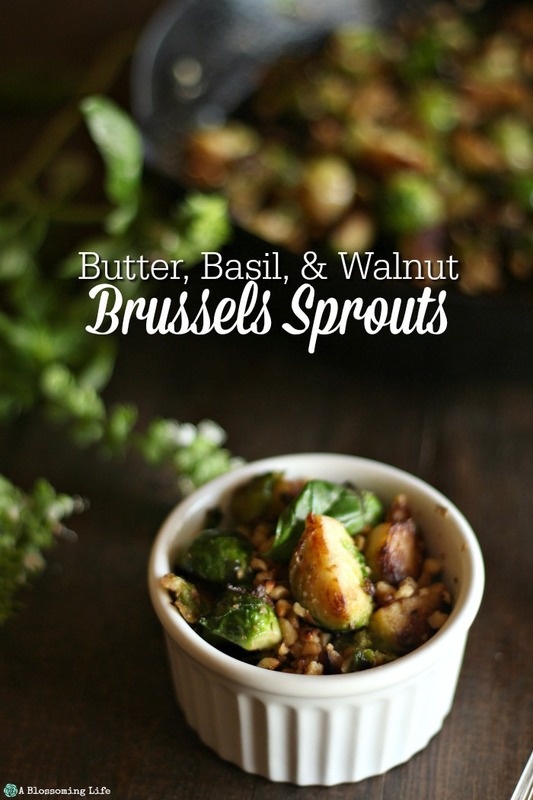 Rinse, trim the stem, and halve the Brussels sprouts. 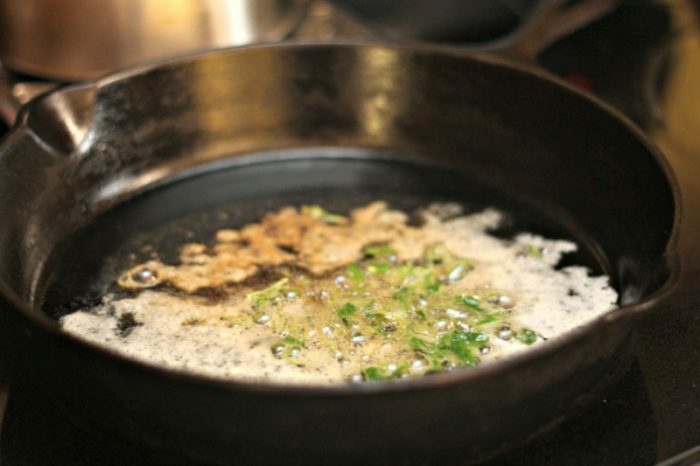 Add butter to a cast-iron skillet over medium heat. Mince the fresh basil leaves. 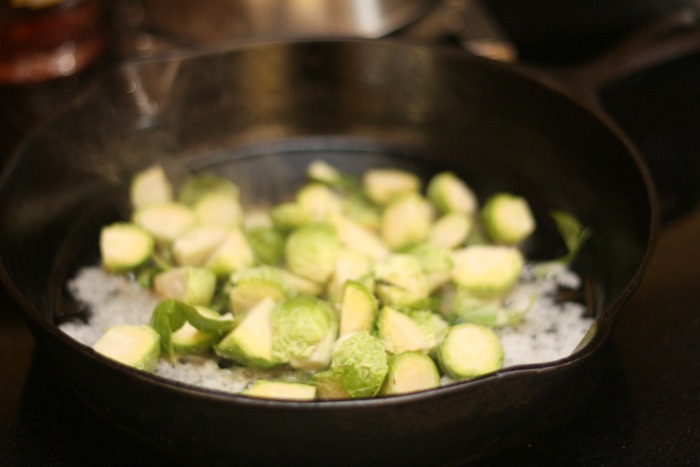 Once the butter begins to bubble, add the Brussels sprouts and basil. Stirring occasionally, saute for approximately 10 minutes. Add the crushed walnuts, then saute for a few more minutes until the sprouts are tender and have developed some caramelization. Serve alongside a main dish and enjoy!